I am a mystic. I am an energy sensitive. I feel deeply, and I have developed a strong connection to Spirit. I am a poetess, a singer, a guide, and vessel for Spirit to work through. I have experienced much loss, grief and sadness in my short life, though it has served as the catalyst for my incredible transformation and awakening. I hold life with an open hand, knowing how precious and delicate it is. I live on the sea of surrender, balancing my action with trust in higher outcomes. I have been an artist for as long as I can remember, always translating my visions and emotions into images and words. I started painting 10 years ago, and it has become my main channel for expressing divine creative energy. I’ve won awards, shown in galleries, been accepted to prestigious art schools, and I have found the path of being an independent artist to work best for the spiritual way that I work - allowing me to focus on my own healing journey and wellness recovery from abuse and illness traumas and making the healing art I do. 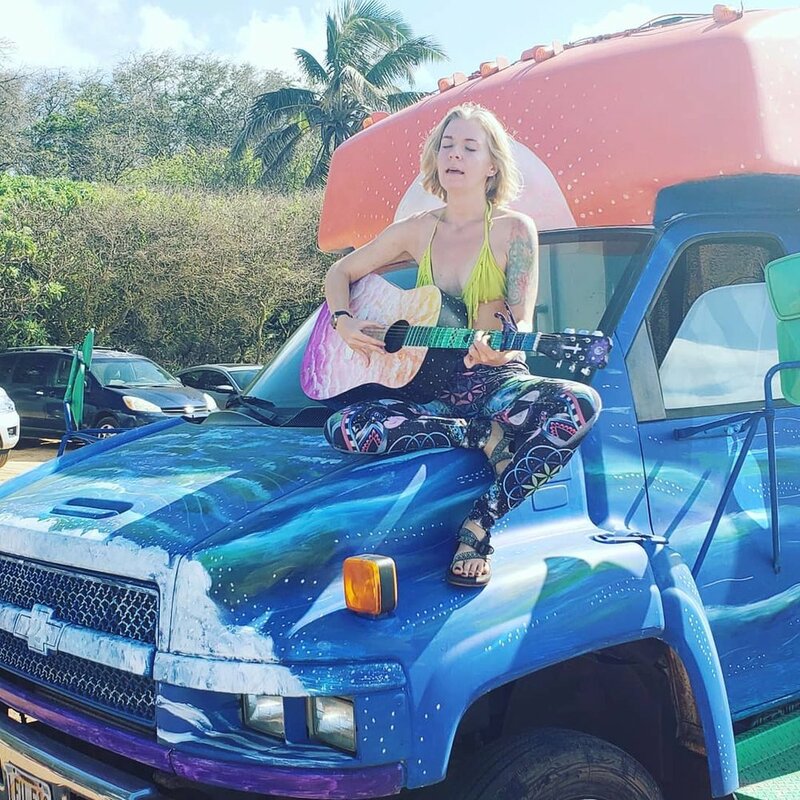 I operate by intuition, leadings, and guidance from deep within, and this art studio tour bus called the Neptune Gypsy is my way for the public to experience me and my art. The nickname Angel Eyes was given to me by my mother at 2 weeks old, when she was convinced that I saw something otherworldly when she was at mass. I have had experiences of seeing energy, auras, and spirits since then, and I experience much synchronicity and much miracles on a regular basis, that it has just become a way of life for me to understand my own spiritual nature and that of the world around me. I am human and have human emotions and experiences, though I am deeply aware of the mystical within everyday life. Sexual abuse and trauma were the legacy of my family, and I have been on a mission to overcome the deep injustice perpetrated in my family, and not just that, but the injustices that affect our society. Sexual abuse is the abuse of power, one that renders victims disempowered & helpless, doubtful of themselves, ashamed, or even violently angry. My body, affected by the chaos and chronic stress response, deteriorated and was ravaged by the Epstein Barre Virus for well over 10 years as a result. I spent that decade in a heavy depression, intimately aware of all the demons and pains that were afflicting me and my family. Through my own self led art-therapy journey, as well as learning about depth psychology, mindfulness, plant-based food and medicine, and Jesus' Love and Compassion, I am Healing Deeply and Transforming every day. Growing in my own truth, learning the preciousness of this female form and trusting my instinctual self and intimately knowing God again. & healing colors all that I do. in pursuit of healing my mind, body, and soul. The journey has taken me to the ends of myself, forcing me to live carried by the grace of the divine, wreckless in my pursuit of healing truths and real love - for myself, my family, and my community. with the hopes of inspiring even just one more person to keep reaching for hope in the dark places. Love is the greatest lesson and achievement in this life. Love for God, Love for Self, and Love for Others. This work is my living practice of what I teach. freedom, resilience, and grace feel like. Me & my husband Paul, and The Neptune Gypsy Art Bus in Maui, Hawaii. If you see us, say hi!